"Andrew,focus the camera near the lake please," I urged our camera man to turn the camera near the oaks. We were a group of 5 researchers and we all worked for "Adventure Channel". Jane,Nicole,Andrew,Richard were the other 4 from my group.We all have been roaming across the Amazon aimlessly for about a week in search of the worlds most dangerous snake called "Ratican".The name may sound strange but its highly poisonous and has the tendency of killing a person within 5 seconds.When we approached the locals for help,hardly anyone offered us any guidance.Finally we all took it as an assignment and left for the biggest snake hunt ever. The Ratican is a colorful snake and has a length of about 8 meters. "Damn,Steve,where the hell is that limbless creature hiding?" Nicole was pissed off after the 12 hours journey. "Nicole,girl its our profession dear,ACTV pays us for this and we have to work,"I said to Nicole. We wandered the Amazon like homeless vagabonds.Somehow I had a strong intuition that we had taken a wrong path.I checked the map once again for verification. "Sir,look this isn't the Berkenstien's path,some one fooled us,we are lost ," Jane was scared and afraid. "Oh! dear no one has fooled us,lets check,"I soothed Jane. "Andrew, guess we came across this lake,didn't we? "I asked my team mate and camera man Andrew if we came through that path. "I guess yes,wait let me check the video camera,"Andrew played his video camera to trace the path. "Yes,Steve,thats the path ,"Andrew added. "Then how come we don't see this place on our map,"Now we all were confused. "Sir, we have to do something,lets leave,"Richard and Jane said in unision. "No, friends,we have to explore the Ratican on our channel and perhaps it would make us famous,got it," I smiled at both of them. "Sir,we are hungry,and our food packets are empty,what will we do now?,"Nicole was famished. "Lets go fishing and search for some nice big fleshy fishes from that lake,"Richard was drooling. We 5 soon headed for the lake.Fortunately we were able to catch 12 fleshy fishes and Andrews contribution was handy as he caught 8 of those.We never knew the name of the creature that we were eating,but it was delicious. "Jane,you cook well,"I patted Jane's back. "Jane,you are awesome,"Richard winked at her. "Umm!Yummy!" Andrew and Nicole said in Unison. We were in the quest of the great Ratican ,the killer snake who got us into a spot.Ratican is an amphibious snake and belonged to the family of King Cobra and the rattle snake. A big Ratican has the ability to swallow a giant sized rabbit. "Lets take some rest,"I said and we slept under the giant Redwoods for a while. We all dozed off for a while.When we got up after 3hrs,we got the biggest shock and we remained stunned.Richard was lying unconcious and his body had turned blue .His face was swollen.When I checked his pulse,everything was over.He was dead. His eyes had turned pink and this itself suggested that the Ratican was some where around us. Richard was perhaps the youngest from our group and an enthusiast for adventure activities. "Steve ,we have to leave now,"Jane was afraid after the Raticans curse. Somehow my guess was correct and the Ratican was one step away from us.We were a step away from exploring the Ratican. "We've lost our friend,comrade and don't want to lose anyone now,"She added. "Nico,it would be nice gift for our Richard,"I said and we searched for the dreadliest snake on earth. 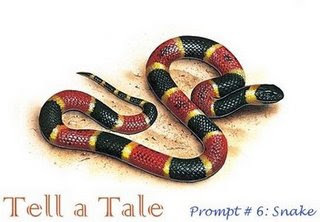 My eyes soon spotted a long snake with black and red stripes separated by a golden fringe. "Andrew,get the camera near it,"I asked Andrew. "Hurray! !We have found the Ratican,"I yelled and screamed. Nicole and Jane smiled and we all were happy.We carefully picked it and placed it on the box and left for America. "Hip Hip Hurray,"we 4 shouted and had a group hug. We remembered Richard at this hour of excitement and we were sure that he would be happy for it . "Finally our mission is accomplished,"I smiled back at Jane,Nicole and Andrew. how could they suddenly wake up? and how mean at the yuppe and hurrays when one of your peep is dead! Nice story. However, a few things stuck me. First of all, I did not find any snake called Ratican. Probably, it’s a result of your creativity, as the rest of the story is. There are few punctuation mistakes and a few spelling errors. Please edit those as soon as possible. I’m sure you see lot of adventure movies and you have described this adventure well too. I have the questions Asbah asked, and I thought of putting my own. I don't know if I would have went after the snake after it had killed one of my friends, but this is the thing that most crew does. No matter what, they get the job done. Remind me of that man who got killed by a Stingray. Nice take on the prompt. An adventure narrated welll.....good stuuff to read and whn u said ""Finally our mission is accomplished,"I smiled back at Jane,Nicole and Andrew." ther was indeed a feel of DONE..
haha...nice one ste..! i dint concentrate on the loopholes...., if dere were any.., i enjoyed it...! Good adventure story. I agree with your friends who commented here about a few loopholes. But then, who else would have such a brilliant idea? Creativity meets adventure!!! :))) Steve (H)isssss at Hisssssssss best!!! My Friend, Philosopher nd Guide!! !